Here are a few of the custom pieces Johan designs and builds in addition to Windsor chairs and tables. His 35 plus years working with wood have made him a master craftsman who can create the piece that will be in your family for generations to come. Meeting the needs of customers is one of the hallmarks of our work. 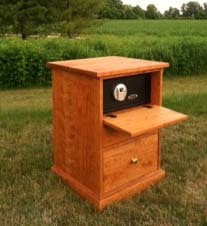 A customer asked for a bedside stand that would conceal a biometric safe to safely house a weapon. This cherry cabinet is the result. Contact us for pricing. 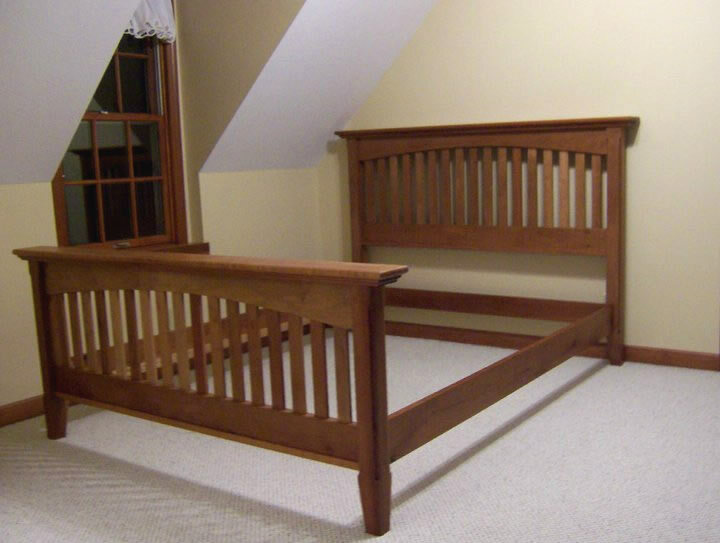 This queen-sized cherry bed frame is an example of the beauty of solid wood construction. This frame will be handed down for generations. Choose a style - Shaker, modern, sleigh. Choose the wood - cherry, walnut, oak, or something exotic. Johan's bookcases are made from veneer core plywood. The shelf fronts have a finished edge. The tops have a crown- molding top that adds distinction and flare to any room. 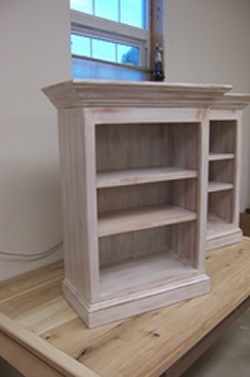 The bookcases can be stained and sealed, or painted and distressed. Other styles are also available. Custom sized - whether you need a bookcase for a child's room - or a wall of casework for your office or library - Johan can build it for you. Example shown (24" wide by 36" tall) is $250. plus shipping. Finish shown is oyster white over pumpkin. A friend wanted to buy his wife a terrarium but was disatisfied with what he found available in stores and catalogues - so he turned to Johan for a solution. The result is this beautiful terrarium shown at left. The piece is made of cherry - but can be duplicated in any wood. The aluminum pan at the bottom keeps the wood dry. The roof lifts off for easy access to the plants. Height is 4 feet 5 1/2 inches. Overall 18 1/2 inches square. This piece (in cherry) retails for $400 plus shipping. 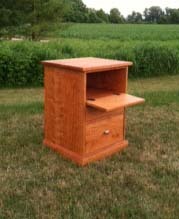 This cherry entertainment center was built for a customer who had the cherry harvested from a family farm. The wood had been stacked in a barn for over 10 years. Johan milled the wood and created this gorgeous corner entertainment center tailored to the client's wishes. The two glass door cabinets are lighted. 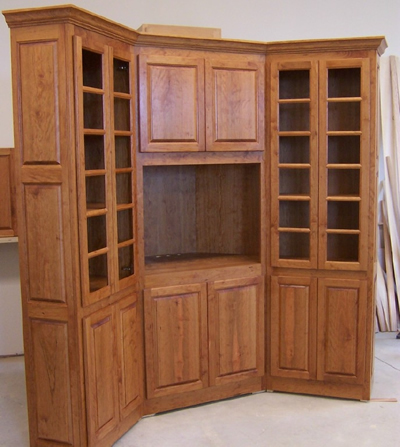 If you would like a quote on a custom designed cabinet - please call 614-332-3246 or contact us. 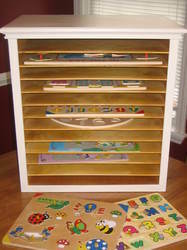 This puzzle box is the perfect place to store children's puzzles and games. Johan built these for his grandchildren. Their mother's appreciate the multiple shelves and the kids love to sit on top of them! These puzzle boxes are 24" high and fit nicely under a window to double as a window seat. These boxes also work well as mail or office organizers on a desk or countertop. Puzzle boxes retail for $95 (plus shipping). Shown in white with antique top coat. This solid cherry server has a beautiful hand-rubbed tung oil finish. The cabinet holds table linens, large serving pieces and is a perfect place to serve dessert on holidays. 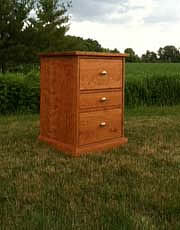 For a custom designed server for your dining room - contact us. Here is another outside-the-box project Johan tackled! A customer wanted these wagon wheels incorporated into a coffee table. It works well in their log home!